For reasons unknown this is a topic that tends to invite comment and hot debate. This is strange as at the heart of the matter are plain and simple mathematics. O.K maybe not so plain, or simple. Architects and Surveyors will tend to offer guideline figures for renovation or conversion projects ranging from €750-€1500 per square meter. Who am I to argue? They are obviously experienced in their field and the fact that they base their estimates for overseeing works at between 10% and 15% of these sums has got nothing to do with the figures they quote. Whilst on the matter of percentages. A fairly good guide as to the breakdown of building costs is 45% Materials, 40% Labour and 15% Overheads. The overheads figure includes profit for builders and costs of services e.g. water, electric for the works. These are just the bald facts. Any project is going to cost money. The amount is variable according to things like how much are you going to do yourself? Cutting down on labour costs. What materials are you going to source yourself? Controlling quality and price. How long do you have to complete the project? This determines the number of people you have working for you and therefore labour costs. A good set of plans either self-produced or drawn by an expert, not necessarily an architect, should be used as a resource for budgeting. My intention is always to focus on the idea of people taking on some tasks for themselves. Accordingly I offer the following as an example. It is taken from a project of an attic, grenier conversion. It is an example of an end room, but the underlying principle can be applied to any room in the house. This was drawn on squared paper and just gives a bigger view of a room from the overall house plans. By looking at the “shopping list” we can itemise the basic requirements of the room. Going on-line to Brico Depot allowed me to price this today at just less than €1800. This is a base figure to work from and not everybody will source from Brico Depot. You pay your money and make your choice. At €90 per square meter, (€1800/20 sq. mtr = €90) we’re still a long way from the base figure of €750 mentioned above. Other rooms; kitchens, bathrooms will be more expensive. However, a kitchen is a room as well and kitchen units, sinks, cupboards and worktops for example can be accurately priced using available on line software available at, Ikea or Lapeyre websites. Other considerations will require estimation via artisans or other means. 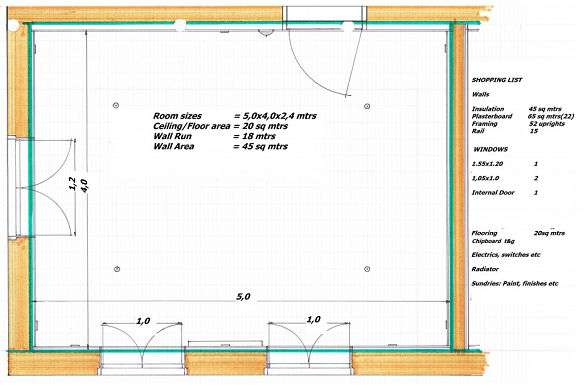 A set of plans, well drawn will enable tradesmen to give fairly accurate estimates for building works such as roofing, window openings, electrics and plumbing. This is where the planning as an exercise linked to budget thoughts comes in. The dimensions of windows, and therefore openings, were determined by the fact that these window sizes are standard and available, so cheaper. I am not suggesting this as a way of accounting for every eventuality in a conversion/renovation project. What I am suggesting is that it’s a good way of getting a start on the way you think about and organise your thoughts re materials and hardware. As a final thought, on a more philosophical plain, about budgets and costs. The level of affordability of something is directly proportional to the level of desire of the object. In other words the more you want something, the more you’re willing to pay.